What is the best therapy to treat sarcoids on horses? 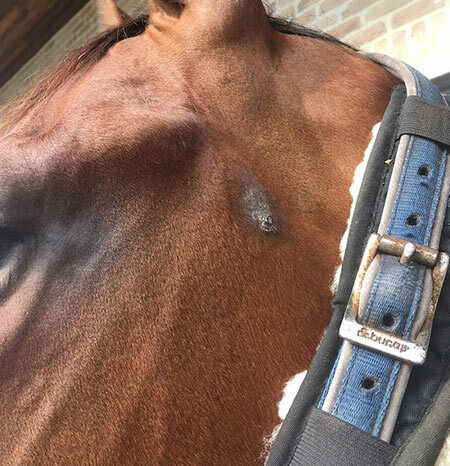 Home » Indications » My horse has sarcoids, what should I do? 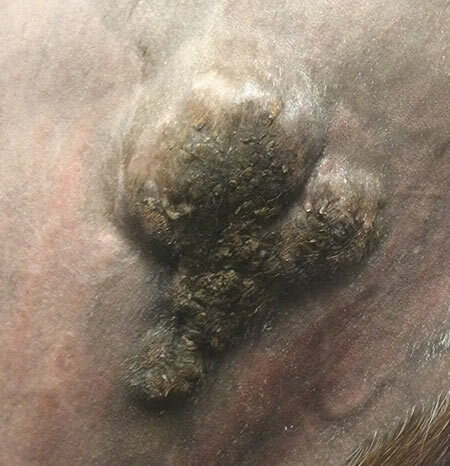 Sarcoids are local lesions similar to warts. 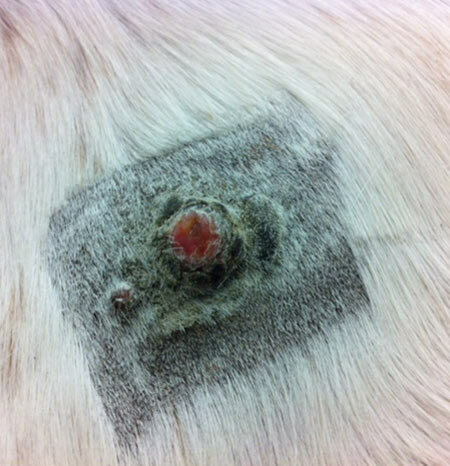 It is the most frequent benign (non-cancerous) cutaneous tumor (35% to 90%) present on equine animals. It is caused by the cow papillomavirus, which grows on horses, ponies, donkeys and zebras aged from 1 to 7 years old, which have been in contact with, or in proximity to this virus. However, stable horses can also be infected. Indeed, other reasons, such as genetic factors can occur, causing some breeds to suffer more than others. Quarter Horses are twice as likely to contract a tumor than Thoroughbreds. 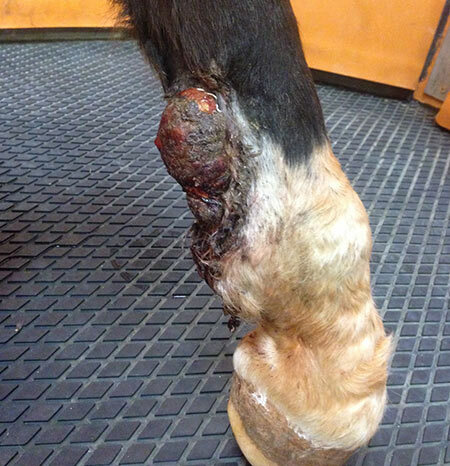 Moreover, Geldings tend to develop sarcoids at higher rates than stallions or mares, due to the castration traumatism. Sarcoids can occur in a spontaneous way or following wounds, scars, bites or stings, which can favor its apparition. The young horse would be subject to develop a unique tumor which multiplies with its age. 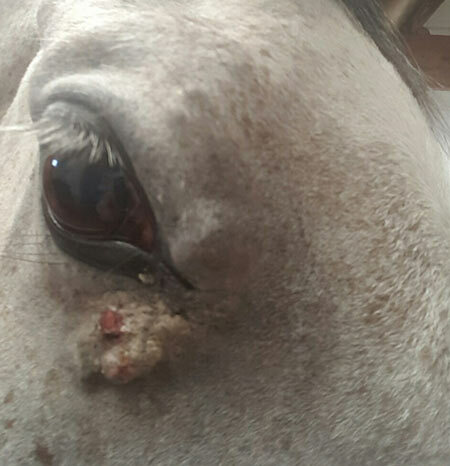 Even if this equine disease does not represent a danger for the life of the animal, the painless but esthetic consequences can lead to an incapacity to use the horse, due to the frequent localization at the passage of the cinch or the bridle, which can provoke an irritation. Generally, sarcoids are located on the limbs at 50%, and 32% on the head and the neck. The diagnosis comprises primarily observation, and a histopathology and biopsy. Occult: flat, observed on hairless, scabby and squamous parts, thicker and ultra-pigmented skin. Verrucous: similar to a large wart. Fibroblastic: exuberant fleshy masses, often due to a wound or another type of sarcoid, due to a traumatism. Nodular: Delimited and firm subcutaneous swelling. Mixt: intermediary stage between two other kinds of sarcoids presented before. Many therapeutic ways exist to counter this recurring problem: surgery, immunotherapy, chemotherapy, radiotherapy, cryotherapy ect. Nevertheless, because of its recurrence of almost 50%, this tumor remains a real problem for the veterinary surgeon. However, one treatment has proven to be efficient in this recurrence struggle against sarcoids, melanomas, fibrosarcomas and squamous cell carcinomas: the electrochemotherapy, a therapy highlighted by the retrospective study of the Professor Tamzali from the Veterinary School of Toulouse (EVJ, 2011), and one of the Professor Tozon from the Veterinary School of Ljubljana (Veterinary Record, 2016). Professor Tamzali treated 194 sarcoids: 15 occults, 80 verrucous, 30 nodular, 35 fibroblastic and 34 of mixt way on 48 equids with an efficacy rate of 99.5% per tumor on 4 years without recurrence. As for the Professor Tozon, she treated 70 sarcoids: 5 verrucous, 2 nodular, 25 fibroblastic and 9 mixt on 32 equids with an efficacy rate of 92.3%. This therapy, conducted under general anesthesia, is a combination of chemotherapy (injection of anti-cancerous products) with the application of short, intense electrical pulses on the entire lesion. The electrical field increases the temporary permeability of the cells and increases 70 fold the penetration rate and the accumulation of the cytotoxic drug (Cisplatine) inside the targeted cells. According to the size and the infiltration of the tumor, one to four sessions are required with an interval of four weeks. No secondary effect has been observed. Muscular contractions without consequences can occur during the electrical impulsions. What are the other therapeutic ways to treat a sarcoid? Surgery: Ablation of the tumor. Cryosurgery: Extreme cold destroys the tumorous tissues. Laser therapy: Evaporation of the damaged tumorous tissue. Hyperthermia: Drying of the necrosis with the placing of little Lycra elastic band at the foot of the sarcoid which provokes its falling off. Phototherapy: Destruction provoked by a photosensitive substance activated by light exposure. Immunotherapy: Destruction of the tumor cells by the immune cells which have been created with the injection of antimitotic substance, or the human vaccine of BCG directly into the tumor. Local chemotherapy: Death of the tumor cells due to the application of antineoplastic products on the surface of the tumors which prevents the biosynthesis of DNA and RNA, or impossible cell reproduction with the injection of antimitotic products. Complementary therapy: Phytotherapy, homeopathy, etc. Most veterinarians who deal with sarcoids say that they are frustrated by their incapacity to definitively treat sarcoids. However, those who have tested electrochemotherapy recommend it: Clinique de Grosbois, Chaparral Veterinary Medical Center and RVC Equine Referral Hospital. LEROY Biotech wants to highly thank Dr. John Schumacher, Dr. Ilaria Marano and Dr. Mathilde Leclère for sharing with us the pictures of sarcoids.